Since we established, our experienced engineers quickly utilized power-supply ICs from each IC manufacturers and we have been working for development of switching power supplies that meet customers’ needs from the aspect of cost, skills, etc. Keeping such basic attitude, we will quickly spot a technology trend in the power supply industry, incorporate it in our design and development, and continue to provide products that are appreciated by customers. Regarding transformers for switching power supply, we received a favorable reception about the transformer that secured a distance between the primary and secondary sides by our original bobbin, however, with development of the SPT series, the new bobbin series will be added in our product lineup.We are confident that you will be satisfied with our new series more than ever, as it is further considered in details. For the design of power supply or transformer, we will serve your every needs! 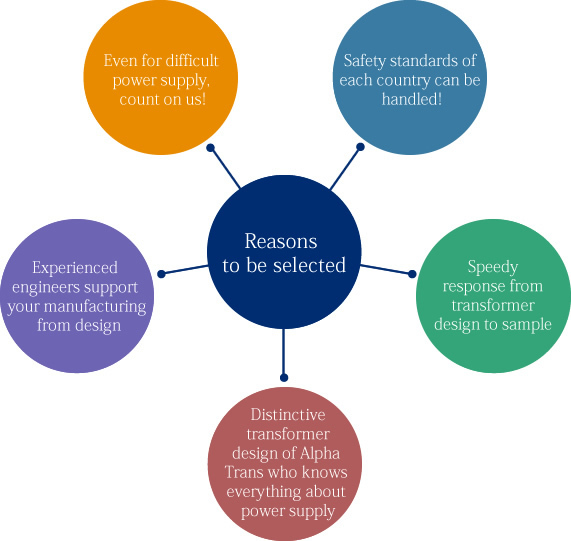 Alpha Trans has a transformer for small power supply with optimized design, such as the SPT series. Even if your need doesn’t meet the SPT series, we will promptly design and provide samples. In addition, when special bobbins such as special shape or other output are required, design bobbins in a short period of time, make molds and provide samples.